“An apple a day keeps the doctor away” was the first nutritional advice myself and many children heard from their moms. Many of us forget that sometimes, the simplest answers are the best. Apples are packed with disease-fighting vitamins, antioxidants and more, easily making them one of the top-ranked fruits for your health. Read on to learn more about health benefits of apples. Some studies have found that apples, and especially apple peels, have powerful antioxidant activity and can potent anti-growth activities against cancer cells in the liver, colon and breast. 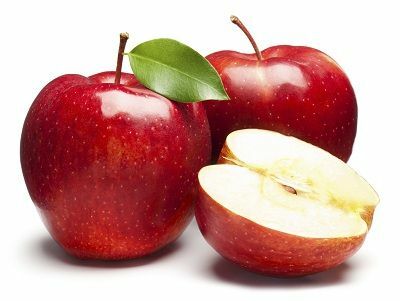 Consumption of flavonol-rich apples could help reduce your risk of developing pancreatic cancer by up to 23 per cent. In addition, apples provide a small amount of skin-friendly vitamin A. Vitamin A might reduce the risk of skin cancer, according to the Linus Pauling Institute. Of the flavonoids tested in the study, quercetin, which is found in apple peels, has been investigated for its blood pressure lowering effects in humans. Apples are rich sources of antioxidants such as flavonoids and vitamin C. Antioxidants help to protect blood vessels from damage, which plays a role in maintaining healthy blood pressure. And, most importantly, be sure to never ditch the peel! Many health problems are associated with being overweight. To manage your weight and improve your overall health, doctors recommend a diet rich in fibre. Eating just one apple a day (with the skin) will give you an average of 4.4 grams of fiber, about one-fifth of your daily need. And apples are low in calories; 100 g of fresh fruit slices provide only 50 calories. According to a Brazilian study, eating an apple before a meal helped women lose 33 percent more weight than those who didn’t. Apples are good for neurological health. The fruit contains an antioxidant called “quercetin” which reduces cellular death caused by oxidation and inflammation of neurons. A new study performed on mice shows that drinking apple juice could keep Alzheimer’s away and fight the effects of aging on the brain. For people with digestive problems, apples are an easy way to get you back on track. When eaten with the skin, apples are a good source of insoluble fiber. This type of fiber provides bulk in your intestinal tract. Insoluble fiber helps hold water, softens your stool and moves food quickly through your digestive system. Apples also contain the soluble fiber pectin. Soluble fiber has been shown to slow down digestion by attracting water and forming a gel which ultimately helps you feel fuller longer. For this reason, a diet high in soluble fiber is recommended for people who have a problem with frequent loose stools. The latest pioneering research in America has revealed that drinking apple juice and eating apples can reduce the risk of heart disease. Participants added only two apples or 12 ounces of apple juice to their diet daily and positive effects were evident after only six weeks. The phenolic compound found in apple skins prevents the cholesterol that gets into your system from solidifying on your artery walls. When plaque builds inside your arteries, it reduces blood flow to your heart, leading to coronary artery disease. A group of researchers at The Florida State University stated that apples really are a “miracle fruit”. Apples are one of the top fruits with plenty of pectin, a soluble fibre that reduces cholesterol. Researcher found that older women who ate apples everyday had 23% less bad cholesterol (LDL) and 4% more good cholesterol (HDL) after just six months. For that much of a reduction, eating apples may be the easiest way to lower your cholesterol.